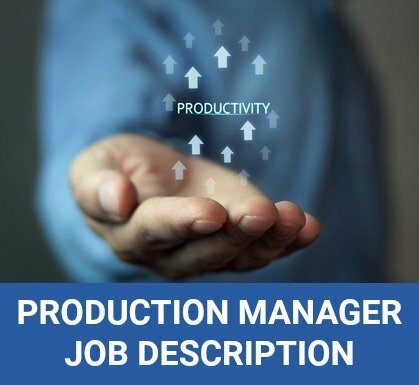 This production manager job description clearly outlines the core tasks, duties and responsibilities of the production manager role. Regardless of the industry, the production manager's main function is to ensure the efficient and timely production of goods. Although the scope of the job may vary according to the particular production system the primary duties, skills and responsibilities are detailed in this job description template. Adapt this sample production manager job description template for your own purposes. To plan, organize and control production in an organization to ensure that goods are produced efficiently, on time, within budget and to standard. Use the sample production manager resume to develop a persuasive and professional resume. According to Indeed.com the average salary for job postings for a Production Manager in the US is $73,690 as of April 2019.